Product prices and availability are accurate as of 2019-01-16 11:21:55 UTC and are subject to change. Any price and availability information displayed on http://www.amazon.co.uk/ at the time of purchase will apply to the purchase of this product. All six episodes of the British comedy series created by and starring Matt Lucas. 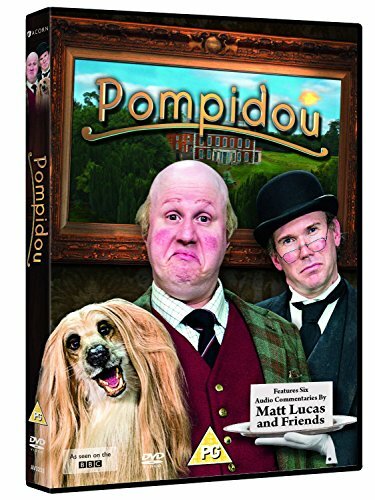 Pompidou (Lucas), an eccentric English aristocrat, lives with his butler Hove (Alex MacQueen) and their Afghan hound Marion in a dilapidated caravan on the land of his ancestral stately home. As the loyal Hove struggles to satisfy his master's unusal tastes, the unlikely trio embark on everyday life activities including hunting for their dinner, swapping a priceless heirloom for a cheap imitation, and signing up to a dating agency. Jane Asher, Anita Dobson and Rebel Wilson make guest appearances. The episodes are: 'Hunger', 'Lottery', 'The Bowl', 'The Date', 'Hoarder' and 'Cold'.